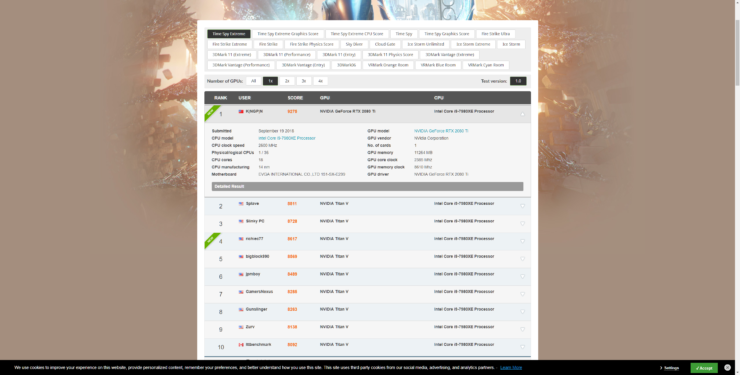 The NVIDIA GeForce RTX 2080 Ti reviews went live today and all tech reviewers (including us) gave you the performance metrics of the new flagship graphics card. 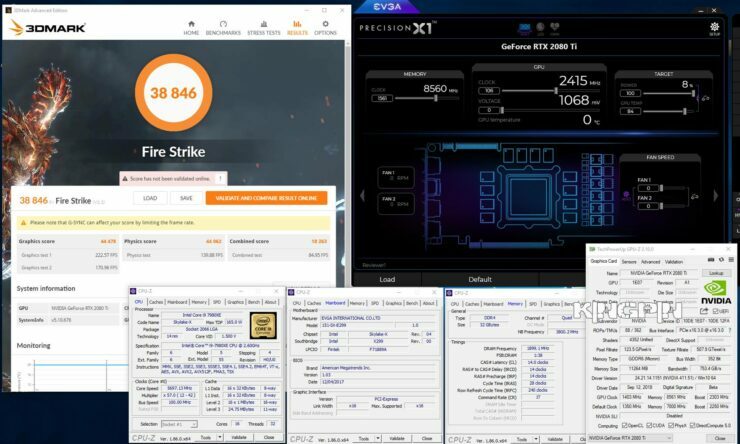 While most benchmarks of 2080 Ti were compiled using stock frequencies with only a handful of press taking a look at overclocking numbers, EVGA’s in-house overclocker, KINGPIN, managed to push the reference 2080 Ti board to its limits. 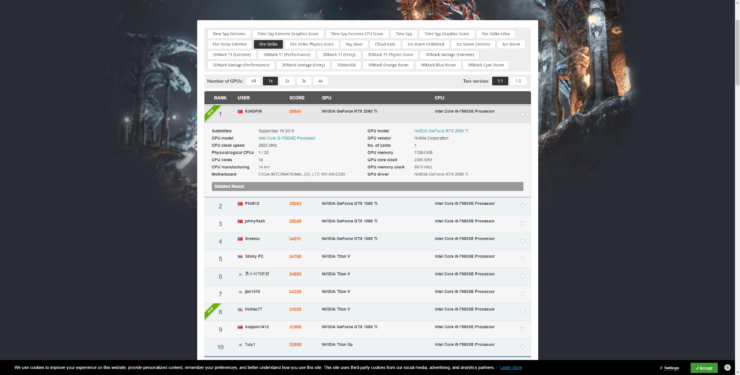 The NVIDIA GeForce RTX 2080 Ti is the flagship graphics card based on the Turing GPU. It is also the one most enthusiasts are looking forward to when it hits market availability on the 27th, next week. 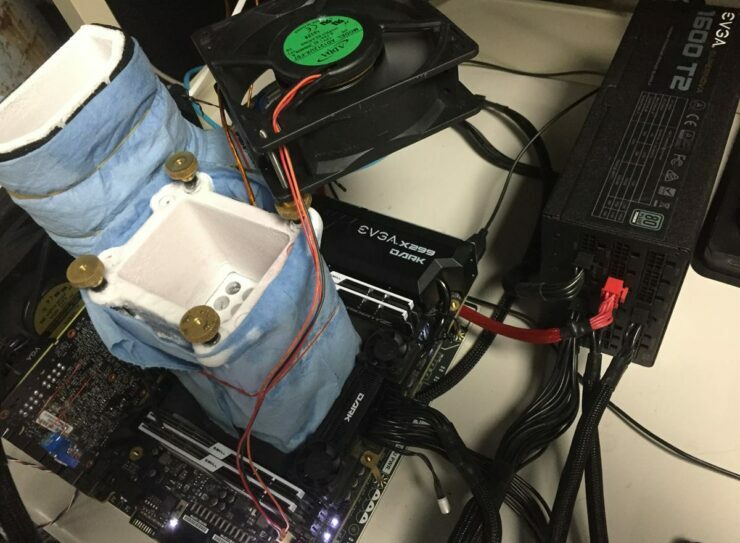 While we wait for the cards to get in the hands of gamers, professional overclocker KINGPIN has hit the maximum potential of what the reference card is able to achieve with liquid nitrogen cooling. 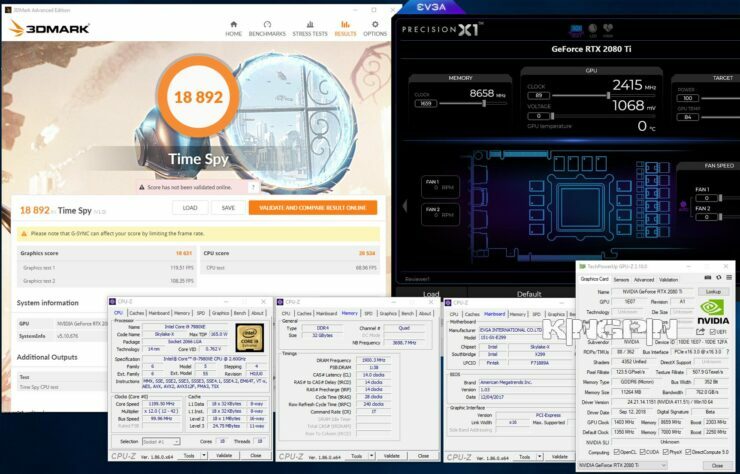 Using the EVGA Precision X1 application, the reference GeForce RTX 2080 TI was pushed to 2415 MHz on the GPU and up to 8633 MHz (17226 MHz effective) clocks on the 11 GB GDDR6 memory. The card was volt modded by KINGPIN himself and managed to bypass the voltage limits set by the green team themselves. 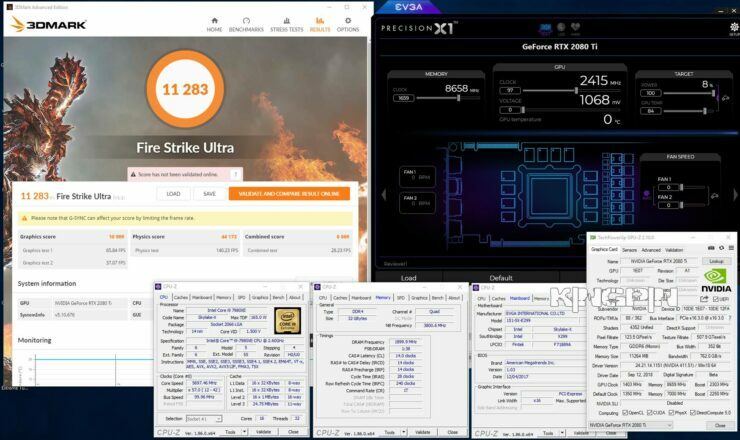 All of this along with some LN2 made the graphics card so fast that it was able to hit the top positions of all 3DMark benchmarks including Timespy Extreme, Timespy, Firestrike, Firestrike Extreme, and Firestrike Ultra. 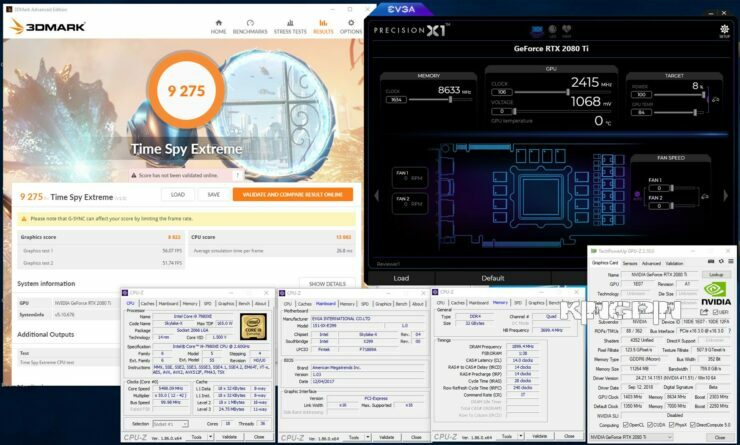 The performance was tested on an LN2 overclocked Core i9-7980XE running on the EVGA X299 Dark motherboard with the CPU clocked at 5.5 GHz across all 18 cores. There was also 32 GB of G.Skill Trident Z DDR4 memory clocked in at 3800 MHz in Quad-channel model. 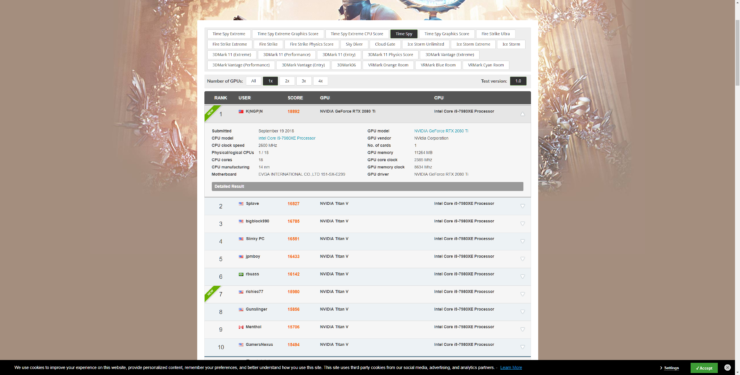 In Timespy Extreme, the setup managed a score of 9275 points and 8822 graphics points. In the standard Timespy preset, the setup managed 18892 points and 18631 graphics score. 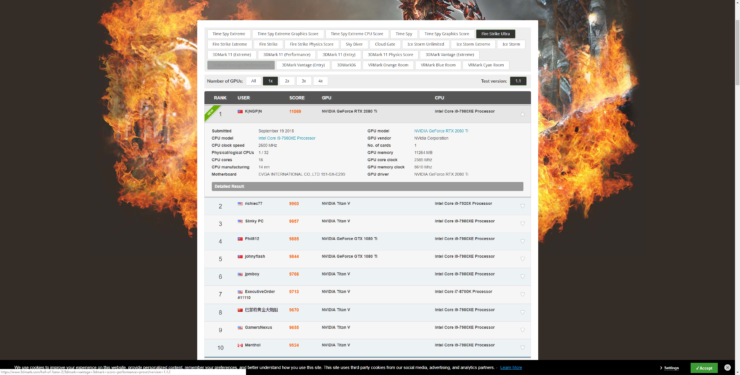 In Firestrike Ultra, the setup managed 11283 points and 10909 graphics score. 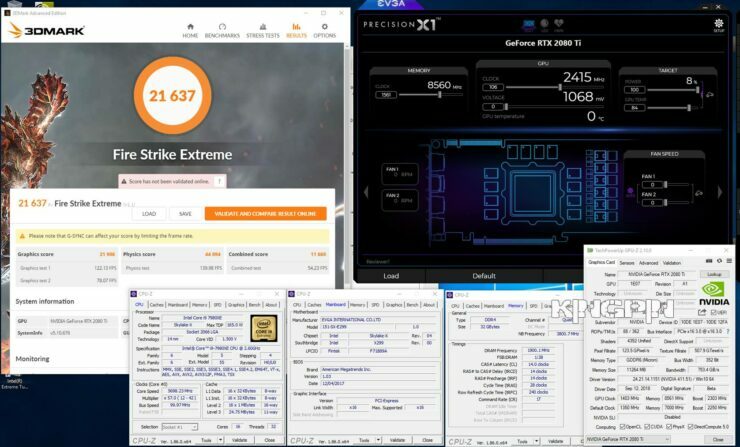 In Firestrike Extreme, the setup managed 21637 points and 21906 graphics score while the standard Firestrike run scored 38846 points for the entire setup and 44478 points for the graphics card. 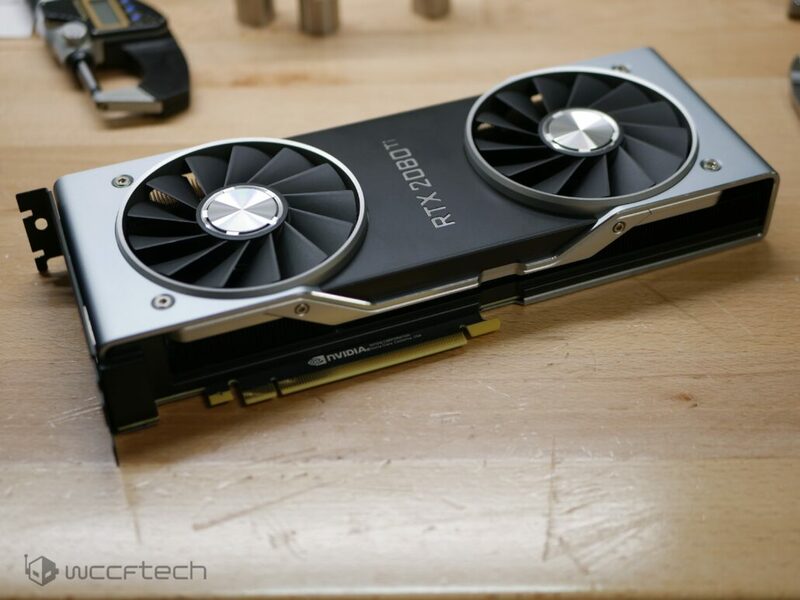 The GeForce RTX 2080 Ti features an extremely well-built PCB design on the Founders Edition variant but AIBs are definitely working on higher-end custom PCB variants which would deliver even better-overclocking experiences for professional overclockers. 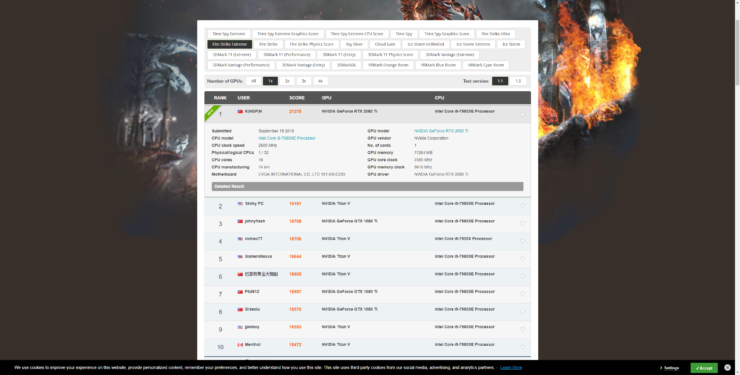 There are many custom models of the RTX 2080 Ti graphics card to select from, we compiled the models here which you can check out.